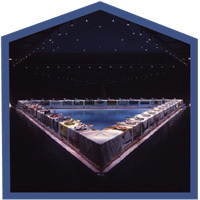 Encounters includes 14 different approaches to The Dinner Party that are based upon some of the activities developed by the Curriculum Project Team at the initial Dinner Party Teacher’s Institute held at Kutztown University of Pennsylvania in 2006. Also included are a number of classroom examples and activities from teachers that were instituted by some of the Institute attendees. These Encounters were selected to demonstrate the different ways in which The Dinner Party can be used to educate, inspire, and empower students. (Whenever possible, we have suggested an appropriate grade level.) Some Encounters offer classroom examples and some do not, but all of the Encounters offer opportunities for learning. The Encounters are grouped in a sequence with particular goals in mind. The first part, Encountering The Dinner Party, introduces students to the work of art. It is very important to begin any Dinner Party curriculum with images of the art. Teachers can be aided in this by the Resource Packet, which can be purchased from Through the Flower at a modest fee. These visual materials allow teachers to select age-appropriate images for their classroom. The second part, Raising Consciousness, is intended to help students think about gender and how it shapes them as individuals, as well as how The Dinner Party acts to raise consciousness of gender issues. As Marilyn Stewart writes in the Introduction to Gender Matters in Art Education (Rosenberg and Thurber; 2007; Davis Publications):Because so much of what we believe and value is powerfully embedded in the images we carry around with us, and because one of the best things we do as art educators is assist our students in critically interpreting the meanings found in images…art educators have to systematically address gender matters. Part Three, Creating Context, helps students to better understand the content and context of The Dinner Party by introducing ideas about feminism and feminist art. I have provided a short explanation about why it is important to study feminism today, despite efforts to disavow its ongoing importance. The fourth and largest part, Exploring The Dinner Party, provides a multiplicity of modes of study of the symbolism and meaning of the components of the work, the use of metaphor in the piece, and the artistic intentions that underlie the form and structure of The Dinner Party. The last part, Building on The Dinner Party, demonstrates the way in which the study of an individual place setting can lead to an entire curriculum: in this instance, a companion curriculum that focuses upon Susan B. Anthony (1820-1906) and the Suffrage Movement. Created by Hannah Koch, a young art educator who is completing her Master’s degree at Kutztown University, this innovative curriculum is intended to act as a springboard for thinking about the potential of The Dinner Party in terms of K-12 art education. Over the years, many teachers have utilized The Dinner Party in the classroom, primarily through art-making projects. This Curriculum might seem lacking in studio activities; this is deliberate. The Curriculum Team and I agreed that many of the earlier projects built on the most superficial level of the piece; e.g. imitating the plates and runners. Although there were some “dinner party” projects that were interesting, even profound, most lacked the depth of understanding that can be obtained through studying the work deeply. Moreover, what was missing from many of these projects was discovery, the type of invention that impelled me as a young woman to undertake as audacious a task as the re-telling of the history of women in Western civilization. The Dinner Party Curriculum is predicated upon the idea that art grows out of discovery, that children will find their way to visual forms out of a deep engagement with content. From the beginning of my collaboration with Constance Gee, Marilyn Stewart and the Curriculum Team, I have emphasized a curriculum that is not prescriptive in order to encourage art-making activities that are truly meaningful to the students. I realize that I am not the first person to suggest such an approach nor do I underestimate how challenging such an approach can be, given the constraints of K-12 settings and schedules. This is why I view the Encounters as an invitation to teachers who are interested in a curriculum that encourages students to discover how their particular interests intersect with aspects of The Dinner Party, to find their own voices through it, so to speak. One example of this would be Hannah Koch’s curriculum based upon the Susan B. Anthony place setting; this became a pathway to the exploration of issues important to Koch. She found a way to both explore and build upon The Dinner Party, which led to an abundance of art-making ideas. All of us involved in developing this Curriculum want it to be a living tool, one that can be expanded upon by teachers for decades to come. What we have tried to create is a basis for explorations, discoveries, and an expanding array of projects and activities. Some of these might involve hands-on art making but if so, we want the art projects to reflect the diversity of voices in your classrooms as a step toward creating a world in which there is space for everyone.